Aquamira 1 oz. Water Treatment (Chlorine Dioxide) kills bacteria while enhancing the taste of treated water. 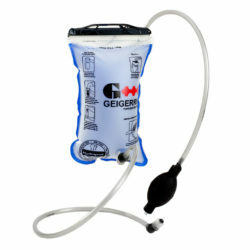 Everything you need to treat 30 gallons in the field comes in a compact, lightweight kit and works in virtually every situation. It’s so effective, even the CDC recommends Chlorine Dioxide as the most comprehensive water treatment available. 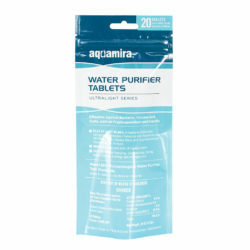 Aquamira Water Treatment effectively kills bacteria and enhances the taste of treated water. Unlike iodine or other treatments, Aquamira won’t discolor your water and improves taste. It’s no wonder why the CDC recommends using Chlorine Dioxide for treating water in the backcountry. 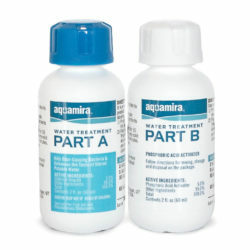 Chlorine dioxide is generated when the Aquamira® Water Treatment comes in contact with water. Chlorine dioxide is iodine and chlorine free. The unique formula works by releasing nascent oxygen, a highly active form of oxygen, which is a strong oxidant and a powerful germicidal agent. Chlorine dioxide has been used by municipal water treatment plants to kill a variety of waterborne pathogens since the late 1940s. Unlike free chlorine (familiar as household bleach) or other halogen chemicals (such as iodine), chlorine dioxide does not create potentially harmful by-products. 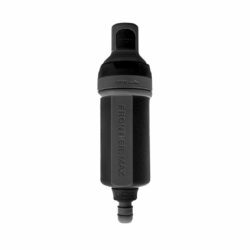 Aquamira’s key benefits are clearly evident when compared to the other common portable water treatment chemicals such as iodine. Chlorine dioxide is a significantly stronger oxidant than iodine, with greater pathogen killing power. Unlike iodine, chlorine dioxide kills protozoan cysts such as Cryptosporidium and Giardia which are responsible for over 80% of waterborne illnesses. Chlorine Dioxide does not discolor water, nor does it give water an unpleasant taste. In fact, chlorine dioxide is often used to improve the taste of water by neutralizing unpleasant flavors.